I adore this recipe. I came across it in the December 2006 issue of Food and Wine, and I love it so much this particular issue has not left my magazine basket in 4 years. It just sits there, nestled in with the current issues of Bon Appetite, Food and Wine, and This Old House, waiting for my craving to strike. Or for me to get invited to a potluck where I’ve waited until the absolute last possible moment to make a dessert, and baking something is out of the question. I was inspired to make this by a recent post at Mostly Foodstuffs – Deena was supposed to make this treat for a Passover Seder, but couldn’t find any matzoh. As an alternative, she made a delicious looking flourless chocolate walnut cookie. I have never made the matzoh version, but I do love the version from Food and Wine, which uses saltine crackers for an extra yummy sweet and salty finish. I adapted the recipe by using honey instead of corn syrup, and an extra sprinkle of flaky sea salt, just to put it over the top. 1) Line a 12×17 rimmed baking sheet with a silicone baking mat or greased parchment paper. 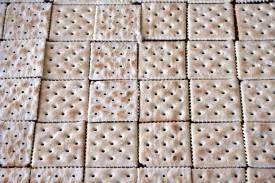 Lay saltine crackers to cover the sheet, filling in the gaps with broken crackers. 2) Begin melting butter in heavy saucepan. Add sugar and honey. Stir until smooth, and then increase heat to medium-high and insert candy thermometer. 3) Heat until toffee reaches 300 degrees (hard crack stage). Stir periodically to prevent burning the bottom. 4) Carefully pour toffee over crackers, and quickly spread to cover every cracker – an offset spatula is helpful. 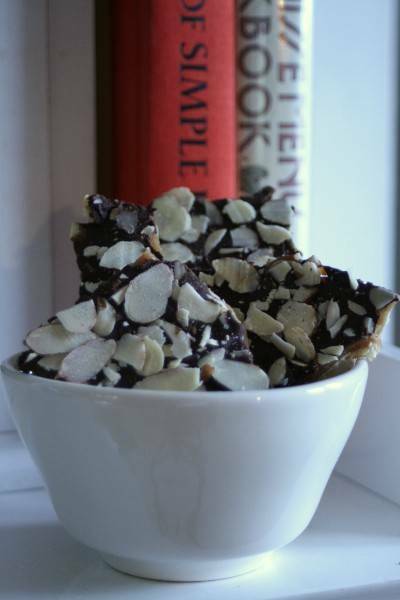 5) Wait about 3 minutes for the toffee to set up, then sprinkle chocolate chips over warm toffee. Wait another few minutes until chips begin to melt, and then spread chocolate to form a thin later over toffee. 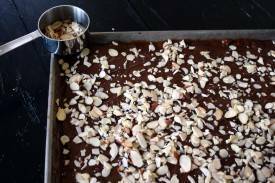 6) Sprinkle with sliced almonds, and then a pinch of flaky sea salt. When completely cooled, crack into shards and enjoy.